SUVA, FIJI– A new scientific report launched today, by the Khaled bin Sultan Living Oceans Foundation, reveals that despite vibrant coral communities, Fiji’s reefs show signs of trouble. Healthy coral in Lau Province, Fiji. The report, titled Global Reef Expedition Final Report: Lau Province, Fiji, is the result of extensive scientific surveys conducted in 2013 by the Khaled bin Sultan Living Ocean Foundation and local partners including the Ministry of Fisheries, the Pacific Blue Foundation, the Lau Provincial Council, and members of the Fiji Locally Managed Marine Area (FLMMA) Network. The research was carried out as part of the Foundation’s Global Reef Expedition, a 5-year research mission to assess the health and resiliency of coral reefs around the world. In Fiji, the joint science team conducted detailed scientific assessments of the health of coral reefs in Lau Province. The research included surveys of the coral and fish communities and the creation of detailed maps of the shallow water marine habitats in the region. In addition, the Expedition visited many schools and villages to share information about the health of the reefs and encouraged villages to create environmental committees to help manage their marine resources. 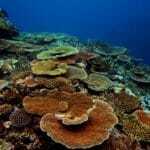 The researchers found coral reefs in Lau Province had thriving coral communities with high coral cover. But they also found the fish on the reef were small, and few large fish remained. On a positive note, the reefs appeared to recover relatively quickly from previous bleaching events and outbreaks of crown-of-thorns starfish, two of the primary threats to the health of Fiji’s coral reef ecosystems, according to Philip G. Renaud, Executive Director of the Foundation. One of the most surprising findings of the expedition was the presence of large cyanobacterial mats in and around the reef. This is an indicator of poor reef health. Declining sea cucumber populations are likely to blame for the extensive cyanobacterial mats found on the research mission. Sea cucumbers are not only an important economic resource for the community, but they are critical to maintaining the health of the reefs. Fisheries officer William Saladrau collected data on sea cucumber harvesting on the Expedition. He found that sea cucumber numbers were low. Populations of some sea cucumber species were so low it was impacting their ability to successfully reproduce. He says they found ‘less than one sea cucumber per hectare, this shows that there is overfishing of sea cucumbers across the Lau Province.